Bearfoot Cabins and Properties, LLC. 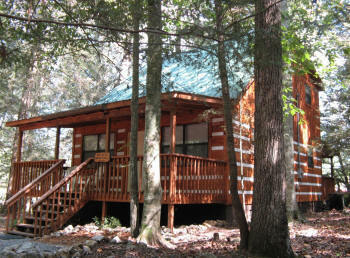 Bearfoot at Rabbit Creek is a rustic log-sided rental cabin located along Rabbit Creek in Cosby, TN. Situated among large Hemlock trees and beautiful Rhododendrons, relax to the sounds of a year-round mountain creek, just a few steps outside the cabin. While on the back porch, enjoy the outdoors atmosphere with a large 4 person hot tub or wooden swing while grilling or enjoying a campfire next to the creek. Bearfoot cabin is located inside the Cherokee National Forest, adjacent to the scenic Foothills Parkway, just north of the Great Smoky Mountains National Park. Cosby is situated on Hwy 32/321, the eastern entrance to the Gatlinburg area off I-40 and is only minutes from Gatlinburg, Pigeon Forge, Sevierville and Dollywood. The small town of Cosby is quiet and away from the hustle and bustle, yet close enough to all that the Smokies have to offer. Some say Cosby is one of the Smokies best kept secrets. Local attractions in the area include Cosby Campground, which is the second largest campground in the Great Smokies National Park and offers numerous hiking trails as well as a very peaceful recreational camping and picnic area. 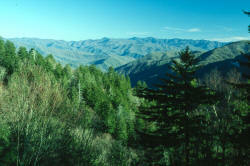 Over 10 million visitors come to The Smokies each year to enjoy all that this beautiful and majestic area has to offer. The Smokies is one of America’s most visited national parks. Local National Park attractions include Greenbrier, Foothills Parkway, Cosby Creek, English Mountain, Pigeon River and Green Mountain.